- The City recently adopted Comp Plan envisions up to 8 dwellings per acre, for the development envelope, which is about ten acres or so. - Actually, true historic development patterns include a mix of housing types and styles, to that period and include "affordable housing". - Creating a very small 'village' nestled in the woods would be a marketing advantage. Also: The City envisions Fall Hill Avenue terminating at the Canal, in front of the Subject tract and then continuing over to the main loop road of the Hospital complex, Sam Perry Boulevard. "Proposed road construction and road improvements are contained in the CityÂ’s Comprehensive Transportation (Roadways) Plan (1991) and incorporated into the regional plan of the Fredericksburg Area Metropolitan Planning Organization (FAMPO). Recently completed improvements include the extension of Sam Perry Boulevard and Mary Washington Boulevard to Cowan Boulevard. The proposed improvements to Fall Hill Avenue absolutely must be linked to an extension of Mary Washington Boulevard. The existing and anticipated traffic on Fall Hill Avenue needs to be diverted to the Route 1 Bypass rather than routed through the residential neighborhood of Normandy Village. The proposed interchange access for Celebrate Virginia does not include access to the east side of Interstate-95." Page 119. Planning Area 4 is bounded by the Rappahannock River and the Rappahannock Canal on the north, the Route 1 Bypass (Jefferson Davis Highway) on the east, Cowan Boulevard on the south, and Interstate-95 to the west. This area includes the portion of the Fall Hill Avenue corridor between I-95 and the Rappahannock Canal, and the Mary Washington Hospital campus. The Economic Development AuthorityÂ’s JumpStart! report recommends specific projects on the Route 1 Bypass (Jefferson Davis Highway), Fall Hill Avenue, and Cowan Boulevard. Cowan Boulevard. Evaluate the street name prior to extending. 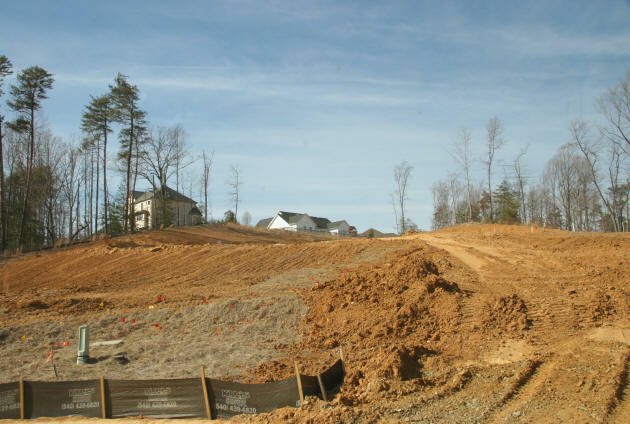 The planning area is characterized by multi-family residential development along Fall Hill Avenue and Cowan Boulevard, and by commercial development along the Route 1 Bypass. The greatest influence on both existing and future development in this planning area is the Mary Washington Hospital campus. Mary Washington Hospital is a full service facility that serves this entire region. It is licensed for 412 beds. The hospital is also the largest employer in the region, with over 2,800 employees. All of the preservation areas in this planning area are City-owned. 1. Preserve the surroundings of the Fall Hill mansion. 2. 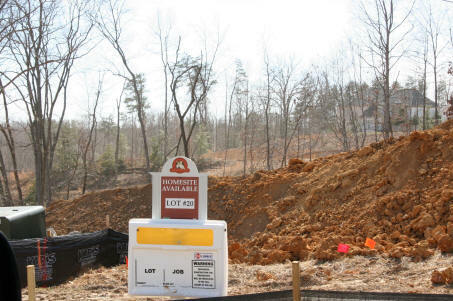 Protect the historic sites and earthworks in this planning area. 3. Improve the Chesapeake Bay Preservation Area designations and other protection measures, to enhance water quality in Smith Run and in the Rappahannock River. 4. Project and maintain the natural and scenic qualities of the Rappahannock River. 5. Ensure a network of natural greenways is established and maintained for passive recreation and bicycle/foot trails. 6. Ensure an improved Fall Hill Avenue includes bicycle/foot trails, as specified in current transportation plans. 7. Protect sensitive land and provide expanded natural and open spaces through clustering of residential units and other development. 8. Establish bicycle/foot trail linkages between new developments and adjacent areas. 9. Provide for the continued development of medical offices and support services on MWH Medicorp/Mary Washington Hospital medical campus. 10. Plant trees along Cowan Boulevard, from the Route 1 Bypass to Smith Run. 11. Support redevelopment of shopping centers along the Route 1 Bypass into more productive and efficient mixed use developments, as shown in the JumpStart report. Above, a concept, per the R-1 zoning, subject to confirmation as to compliance with governmental rules and regulations. A more appealing and environmentally friendly development scenario would result from increasing the density and proffering the four acre river tract to the City of Fredericksburg. Orange: development envelope # 2, good CBR from #1 to be used as fill here. 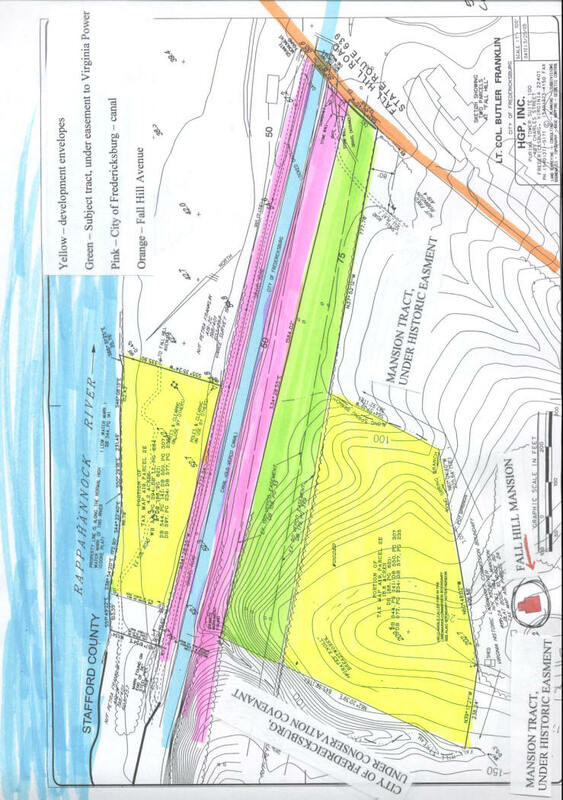 Pink: overburden to be used to construct landscape berms along road and or wasted upon power line rights of way, per Dominion Resource guidelines. 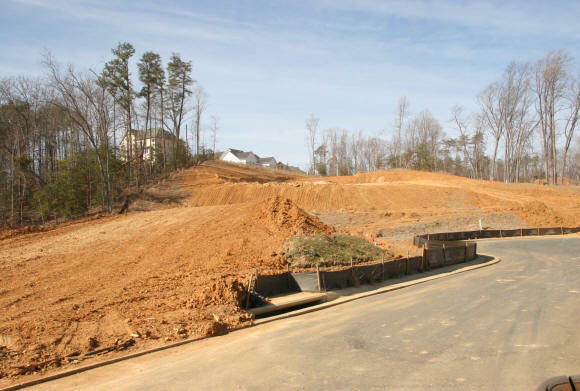 Landscape berms and ponds would be used in conjunction with plant materials to create focal points and an attractive drive into the development. NOTE: 4.2 acres along the river would require a special use permit to develop in the floodplain. It is believed, subject to confirmation, that the chain of title supports the right to bridge across the canal to gain access to the four acre river tract. Or, it is proffered to the City of Fredericksburg as a park, with access for this community as well, in exchange for a higher density to create a more attractive and environmental friendly development. All information is conjectural and subject to independent verification and analysis. 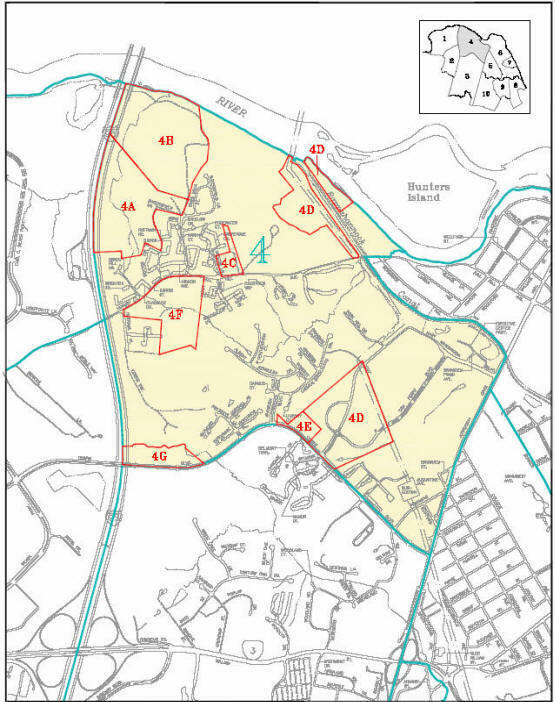 1) By right, at R-1; see icon, "Zoning"
2) Perhaps proffer the 4+ acres on the Rappahannock River to the City for a park, retaining the rights for the residents of the development to use the park, and perhaps gain an R-4 zoning. About 4 acres is divided from the main body of Subject by the City of Fredericksburg property and canal. There are some Civil War trenches near the top of the hill; however, there was no fighting at that location. Subject has a superior location, only minutes from the Regional hospital; University, downtown, etc. The main development envelope is about 12 acres (21 acres less the 5 acres in the power line R/W and less the 4+ acres along the river). However, the power line R/W might be used for (subject to confirmation) for wasting the overburden dirt; storm water detention facilities, view shed kept open to see the river, after trees are cut along the river to improve the views. Basically, the trees would be removed from the approximately 12+ acre development envelop AND the 4 acres along the river (as much tree removal as the Chesapeake Bay Act will allow) and thus create a better water view from the main development envelop; then, after removing the over burden and stacking it as a berm and or possibly putting it under the power line R/W, the next task would be to pan the top of the hill down into the lower section, creating a tiered development envelop. Below, the Estates of Idelwild; the topography was as formidable, if not worse than the Subject tract. Above, this house site ($600,000+ with house) is a narrow band of land backing up to a steep ravine. Subject would make a great "compound" development of a few large estate type houses, one or two at the top of the hill and then several houses at the lower tier. Subject might make for a great site for a religious organization or private school, etc. The topography could be molded to create a tiered effect for the development envelopes.